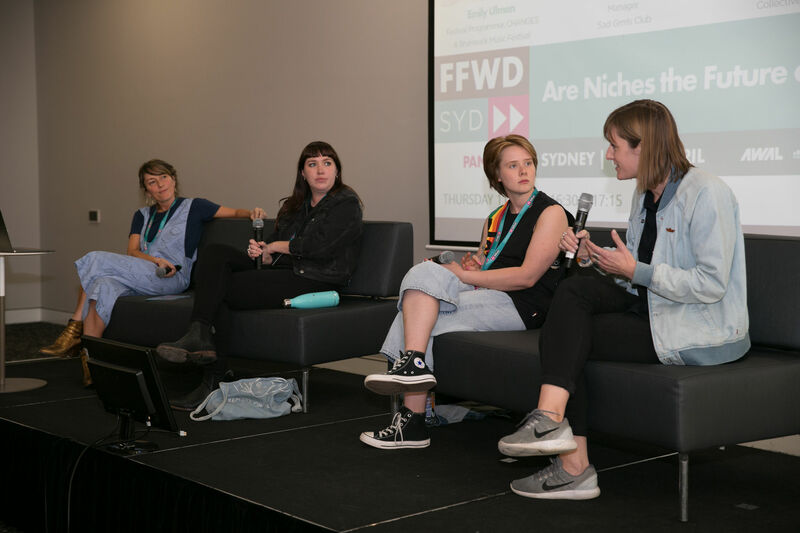 Attendees day one at FastForward Sydney on Thursday saw a panel discussion about the rise of niche music festivals. Emily Ulman, festival programmer at CHANGES and Brunswick Music Festival, was joined by Rachel Maria Cox of Sad Grrrls Club, Rebecca Young from Collective Artists and Renee Hermsen of Live Nation Australia. The question was put to them; are niches the future of music festivals? It will come as no surprise that consumers don’t just want to be seen as another number, and at smaller, niche festivals they can be catered to better than at bigger events. It’s important that festivals put together “offerings based on the audience”, says Young. Hansen agrees, pointing out that if your festival caters to a fantastic experience for individual audience members, they are likely to purchase tickets to the next event even before a lineup is announced. “It’s about the experience for the patrons, that they see themselves represented,” says Cox. Cox, who runs Sad Grrrls Fest, says that public opinion has turned against big festivals who don’t include women or non-binary acts. “Well if you’ve got 50 bands playing, why are only three of them bands that have women in them,” she says. Young agrees, and adds that “artists are being a bit more responsible” and engaged with the process. The panel debated whether festivals are the result of communities coming together, or whether communities come about as a result of festivals. “Festivals create spaces and communities for people to come together and bond,” says Cox. Young put it to the other panellists that its a bit of a chicken and egg situation. Festivals are a bi-product of communities, but they also then keep that community going. Hermsen says that if a festival fails to create a feeling of community, it could be in trouble. “If the festival isn’t already a community, it needs to create a community,” she says.